New Euro Weeklies are slow coming out. Will comment on them tonight or tomorrow as they come. All I've seen so far is a nice burst of snowcover for the US and Canada through day 15. Anything that catches your eye from the Euro Weeklies??? FWIW, GFS whooped Euro on what will become Hurricane Mathew. 00z EURO is OTS after it tracks near Cuba/Bahama's region. EPS is also trending east of where they once had it's members in the Gulf. I wonder what JB has to say about this now??? I love his passion, but sometimes he's overly confident with the Euro. GFS can score a coupe once in a while, esp I've noticed in the Autumn months for some reason. I guess i havent paid a lot attention. Where is this hurricane gonna make landfall? NHC just released their update and the storm is now a Major Cat 3 Hurricane with winds of 115 mph. As far as U.S. landfall, the odds of that happening are dwindling. However, the Caribbean is going to get the worse impacts. Specifically, areas near Jamaica/Cuba/Haiti/Bahamas are in the zone. As a person who has dealt with very sharp snow gradients over the past few years here in MN, I am stoked for what this new pattern will bring! Wow, 12 Euro gets Matthew down to a Cat 5 hurricane!!! Impressive...this tropical storm is looking very healthy. Phenomenal strengthening of Hurricane Matthew. Latest NHC update is now a Cat 4 with 140mph winds! 12z EPS still not biting on a U.S. landfall. Euro is way slower though than the GFS model. Plenty of time to watch this unfold and very interesting to see it unfold. Welcome back buddy. How you been? Euro is cold west transitioning to cold in the central through 14 days. 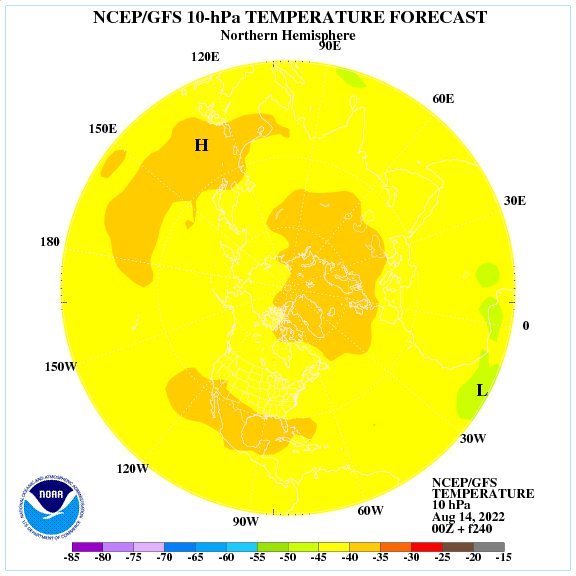 After 14 days and all the way to November 10 it's a torch before going cold central and south in the 2nd week. The fun snow maps are screwed up. Lots of precip making its way into the central plains and GL. Local met has 70s early next week and then down to 60 for a high next Friday. The cloudy, cool, wet last few days of September 2016 took down mean temperature but still ended up at 66.4° (+3.6°) and that will be good for 7th warmest September on record here in GR. I did some looking at the past warm September’s here in Grand Rapids and while I am not a real big believer in Analog years but that said in the past 6 September’s that were warmer then this year (2005,1931,1927,1921,1908,and 1906) the mean snow fall here in GR came to 46.16” (average at GRR is around 75”) and the range of those years was from 30.1” (2nd lowest in GR history) to 69.2” Now we will have to see how the winter of 2016/17 will end up. Welcome to October! It's officially a month where many Winter outlooks are being made and the internal clock begins to shift. There is a lot of weather going on around the globe and the one that grasps our attention in our part of the world is major Hurricane Matthew. 0z EURO/EPS is still OTS and the GFS/GEFS maintain a track up and close to the U.S. coastline. FWIW, the Canadian is mainly OTS but tries to re-curve west towards Maine/Canada. The battle continues. What ultimately happens with this storm down the road, will influence the pattern over the north Atlantic. Some modeling suggesting it may in fact pump a ridge near Greenland and produce a blocking pattern. After digesting the 06z GEFS run, I find it rather interesting how it lays out the cold pool Day Week 2. This is the beginning of the new LRC and I have seen long range/climate models trying to paint a similar cold pool with a NW/SE fashion. Nature giving a sign??? CFSv2 sneak peak into November...wait, didn't I just see something like this??? It's going to change. After using the 10mb/30mb warming tool in September, we saw both a Greenland Block (-NAO) develop for the second half of September as well as a ridge over N/NW Canada. 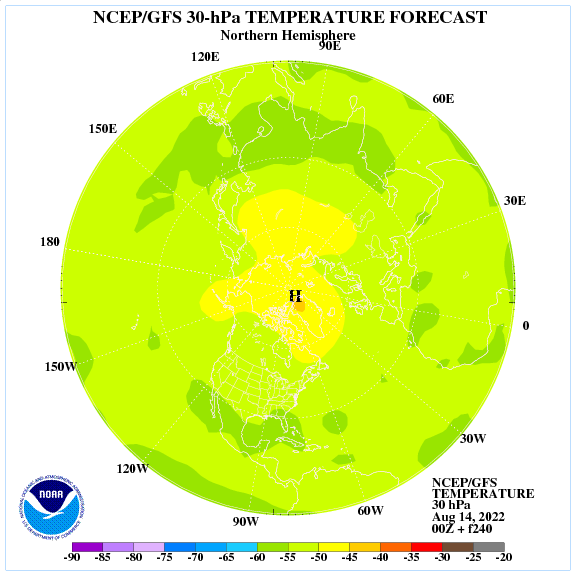 Recent stratospheric warming over and near Alaska is suggesting an Alaskan Ridge to develop (-AO). Let's see how this plays out. GEFS continue to show a -AO, some members down to -3, similar to Okwx maps of the Euro's forecast. I'm currently experiencing an almost perfect set up for Lake Effect rain showers. There is a tight spin right over Gary, IN and beginning to enhance shower activity over southern Lake Michigan. The rain is falling in sheets and/or a wall-like feature as waves of embedded down pours roll in off the lake. Tom, you covered all the bases this morning. Good stuff. Happy October everyone! Edit: AO is even farther negative! Euro is in really strong agreement as far as the teleconnections go. Blocking is going to keep the model behavior whacky! 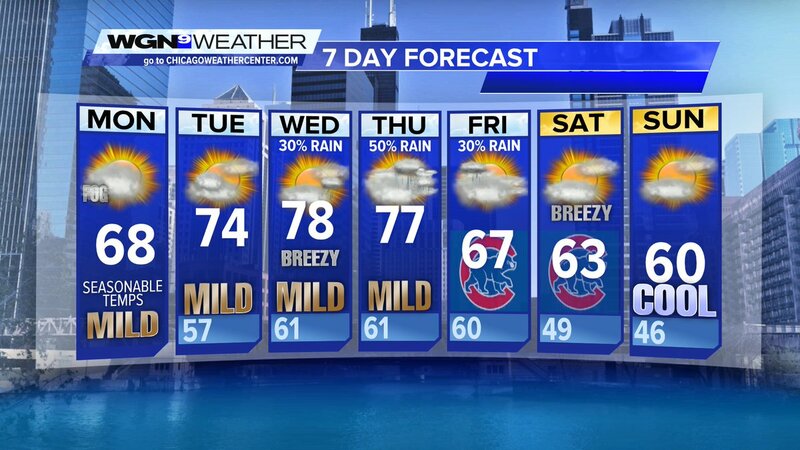 Meanwhile, I'm paying attention locally to the forecast next Friday as Cub's Postseason Baseball begins at home! 12z GFS has a cold front swinging through the afternoon turning winds down the lake...obviously, this will change so I hope for a better outcome. Over the last few runs, the GFS has been hinting at a possible rain/snow mix for NW NE this Thursday. Crazy weather in the Plains this week. From severe storms to possibly snowflakes mixing in on Thursday for the NW part of NE. Gotta love Fall!!! That's gonna be a cold raw and windy day! There is going to be a lot of blocking developing by week 2, something the models totally missed as this new LRC pattern evolves. It's quite interesting how much the ensembles are flipping in the eastern 2/3rds for week 2. Taking a look at the NCEP 30mb Day 10 temp forecast, rising strato heights over the Eurasian continent is creating a very clear and ominous cold signal over N.A. and Europe. Ensembles are starting to flip to a 500mb pattern we have not seen in a very long, esp near Greenland with a tanking -NAO coupled with a -AO. The extended is looking active. After an initial storm tracks into the northern Rockies on Mon/Tue, a weaker storm develops this Thu/Fri and swings up into the western Lakes. Models are picking up on a stronger trough to roll into the Plains by Day 10. Both GFS/GGEM are seeing it and it looks to be a decent storm system. Very nice active pattern if this continues to show up as troughs get handed off by the developing Aleutian Low. For your region, it's way to early in the game. Climo speaking, October's rarely have storms tracking that far south in the Autumn. I'd wait till late November/December period as the jet strengthens. @ Okwx, I bet the cool down coming later this week is going to feel great with high temps in the 60's Fri-Sun! FWIW, 12z EPS on board with another storm Day 9-10...should show more agreement as we get closer...East Asian Theory useful with the re-curving Typhoon near Japan Oct 4th-5th. Very true. I also do know that most of my analogs had very "sudden" starts to winter after boring mid and late autumns. Haven't even had an autumn severe season here yet. I try to rush things some when I actually already know better. I gotta stop that. Lol. Yes it will! Going to be a cold evening for football Friday. I love it! I would not be shocked at all to see my first light frost in that 3 day stretch either. I hope I'm able to be back up and around by then. My double hernia repair operation is in the morning at 8. I think I'm going to purchase a weather station in the very near future. Any good suggestions in the $300-$400 range? My highs for next weekend are projected to be in the 50s and lows in the lower 40s. Now, there is a real nice shot of chilly air! I cant wait til first freeze. Local met has 50s thu/fri highs. Honestly, these mid/upper 70's are going to feel very nice this week! Go Cub's Go! The city is getting electric for postseason baseball. Believe it or not, my father (who doesn't even like baseball) is sparking interest in the team. I remember last year in late October, I saw the first flurries of the season. Afterwards, I saw the first accumulating snowfall of the season in November. Usually early snows tend to make for a sucky winter (not sure if statistics show that) but, it always, most likely favors that path. This week will feature a nice warm-up with temps in the 70s. By the weekend, temps bottom out in the 50s for highs and 40s, if not 30s for lows here in SEMI. I think its safe to say that a few 70s could still be in the forecast down the road in October before they are gone for good until next Spring again. Sept 27, 2013 i saw snow flurries and Oct 22 was first measurable snow. That season started early and didnt let go. Near record snow and cold that winter. My fav one so far in my life. Yeah, that's the scenario we want, not the last gasp of winter just before a strong Nino comes in for the kill. Ofc, there's also the 2011-12 example when my best snow was in November and the rest of the "winter" never failed to disappoint. Clouds rolled in and the wind picked up and cooled off. It was summery a few hours ago and now its fall-like. Leaves are really turning and falling. We don't want a winter like 13/14. Unless you love brutal cold with dry clippers and hardly any monster storms. That makes for a pretty miserable winter imho. Northwest flow is a big no no. How was 83-84 in your area? One of the worse in my area and all of eastern Nebraska. A major blizzard started the winter off with 12" of snow thanksgiving weekend and another before Christmas lead to a streak of like 7 days below zero. I was born on the 21st of December........the high that day was -10 and the low was like -24. (I'm thinking that's why I love winter so much! )That winter makes 09-10 look like a joke...........I love the 83-84 analog. I was talking about for my area. We had a lot of snow and cold. Most of the snow was from clippers and most of the winter was NW flow. When has Nebraska ever done good with clippers? I seem to remember that winter. Brutal cold! I bet that winter rocked for you! That winter for me was also amazing! Every 2 to 3 days we would have a snowstorm! Awesome. Can you tell me where or send me a link to where you made your map?